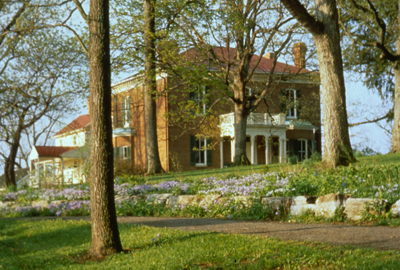 Celebrate the beauty of music and nature with a new series of intimate concerts in the historic Bascom House at the Nature Reserve. Concerts will begin at 3 p.m. After the concerts, enjoy refreshments and time to explore the Whitmire Wildflower Garden. Seats are very limited; reservations required (see bottom of page). Gina Galati will perform light opera and Broadway favorites. Italian-American soprano, Gina Galati is known for her powerful voice and dramatic range, which have won her critical acclaim and a growing repertoire of leading roles. In 2015, she was nominated for a prestigious Miami Life Award as Best Lyric Singer for her recent performance in Don Pasquale at the Miami Lyric Opera. Gina will be accompanied by pianist, Gail Hintz. The 442s will perform a unique blend of jazz, classical, folk, and pop music. Known as a genre-defying acoustic quartet named for the modern standard tuning of 442 Hz!, the 442s blend virtuosic musicianship, group singing and inventive improvisation. The 442s have been profiled on the nationally syndicated television program, Arts America, and their music serves as the soundtrack for the 2016 Emmy Award winning documentary film, Show Me 66: Main Street Through Missouri, which was produced by the Missouri History Museum. Keith Boyer will perform classical opera, arias, and operettas, followed by a set of Broadway favorites. A member of the St. Louis Symphony Chorus, he was tapped to sing the role of the Mr. Swallow, rector of the Borough’s parish church, in Peter Grimes, singing in St. Louis and at New York’s Carnegie Hall. Tickets are $40–$60, depending on seat location. To reserve your seats, please call Dawn Trog (314) 577-9503 or email dawn.trog@mobot.org. One of the original buildings on the site, the Bascom House, built in 1879, was restored in 1996. The Bascom House is open to the public 10 a.m. to 4 p.m. Monday through Sunday. Close by the Bascom House are the Whitmire Wildflower Garden and Pinetum Lake.